A first-half penalty proved decisive as the battling Lilywhites lost out to Swallownest. The spot kick, awarded for a clumsy challenge inside the Skegness penalty area, was despatched by Ollie Grady in the 13th minute. It was enough to clinch the three points and see Skegness slip to 15th in the league table. They are now nine points clear of the drop zone, but on the evidence of this display they should have no trouble avoiding relegation in this first season back in the NCEL. 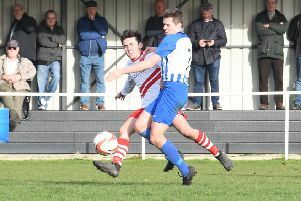 Their second half effort will have given their management team reason to be positive as they look to end their run of poor away results with Saturday’s trip to third placed Nostell Miners Welfare. Despite having Callum Robinson sent off following a second half fracas, Town knocked on the Swallownest door in search of an equaliser and will feel they did enough to earn a point. But they couldn’t find a way past home keeper Josh Lill. And the seasiders had their own goalkeeping hero in James Lambley to thank for staying in the game until the very end. He pulled off a string of great saves to deny, in particular, Alex Lill, who had been the two-goal hero when Swallownest claimed the points in the reverse fixture at the Vertigo Stadium. Committed to finding an equaliser, the seasiders inevitably left gaps at the back but Lambley came out on top in a number of one-on-ones with Lill. Town’s squad included Ben Davison, who received one of four yellow cards as the visitors battled in appalling weather to salvage a point. Other cautions were picked up by Jordan Smith, Will Britton and Andy Parish. TOWN: J. Lambley, Warren, Morrall, Parish, L. Lambley, Norburn, Smith, Ford, Robinson, Davison, Britton, H. Bunce, Evison, Gray, Stevens. Last night (Tuesday) the Lilywhites were due to travel to Selby Town for their long awaited League Cup tie. On Saturday they return to league action when they visit high-flying Nostell Miners Welfare from the Wakefield area.